On Friday, the UT softball team will host McLennan Community College in what will be Mike White’s first chapter at Texas. Well, Texas might actually consider this a prologue to the new coach’s story. A table of contents, maybe. These fall games on UT’s fall schedule don’t count, after all. “I am looking forward to the season starting, albeit an offseason,” White said. Two of the eight games on the fall schedule are against LSU and Texas State, two programs that reached last year’s NCAA tournament. Texas also will scrimmage St. Edward’s and a team of Texas Exes. The Longhorns were last seen wrapping up a 33-26 season at a regional hosted by Washington. Connie Clark, the only softball coach that Texas had ever known, was not brought back for a 23rd season. 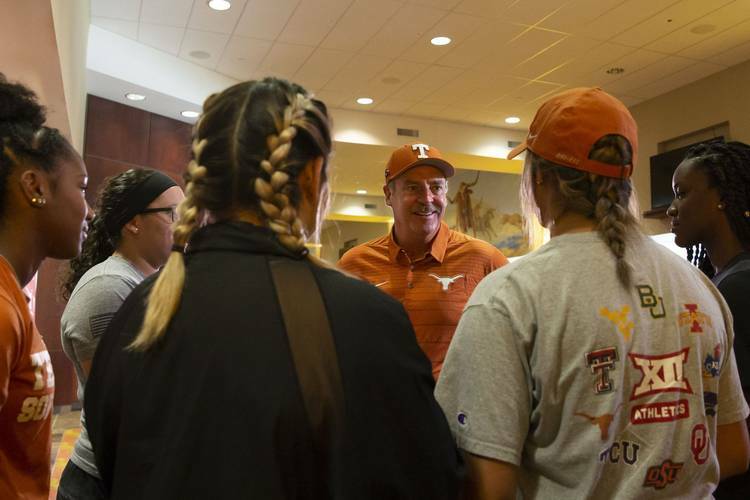 The Longhorns instead hired White away from Oregon, paying him an annual salary of $505,000 to reinvigorate a program that last reached a super regional in 2013. White compiled a 435-111-1 record over the last nine years at Oregon. He guided the Ducks to the Women’s College World Series five times. He brought assistant coach Chelsea Spencer and volunteer coach Kailee Cuico with him from Oregon. Former University of Mary head coach Kerry Shaw has been tasked with instructing the UT hitters. Five weeks into fall camp, players have noticed the new coaches taking a meticulous approach. Texas outfielder Kaitlyn Washington bats against Kansas at McCombs Field on March 28, 2018. Following White’s hire, only one of UT’s eligible returnees left the program. He inherits seven players who had 100 at-bats last year, and senior pitcher Brooke Bolinger threw 117 2/3 innings during an all-conference season. Additionally, the Longhorns added five freshmen and Seminole State College transfer Macy Smith. Who will start for Texas this upcoming spring? According to White, there are only a few positions to confidently forecast. Sophomore Janae Jefferson and junior Kaitlyn Slack return to the middle of UT’s infield. Junior Taylor Ellsworth will continue to catch, and all-Big 12 honoree Washington will be one of the three starting outfielders. White will primarily work with a pitching staff that features Bolinger, sophomores Chloe Romero and Ariana Adams and freshman Shealyn O’Leary. The defense boasted the nation’s 12th-best fielding percentage this past season. Questions, though, linger about an offense that hit .268 and averaged 3.5 runs per game. White described his style of play as aggressive. Upon his hire, White called out the team’s dismal power and base-running numbers. This week, working on plate discipline was on White’s to-do list. (Texas struck out 251 times while drawing 141 walks this past spring.) Since all four of UT’s coaches can throw, the Longhorns will participate in a lot of batting practice.